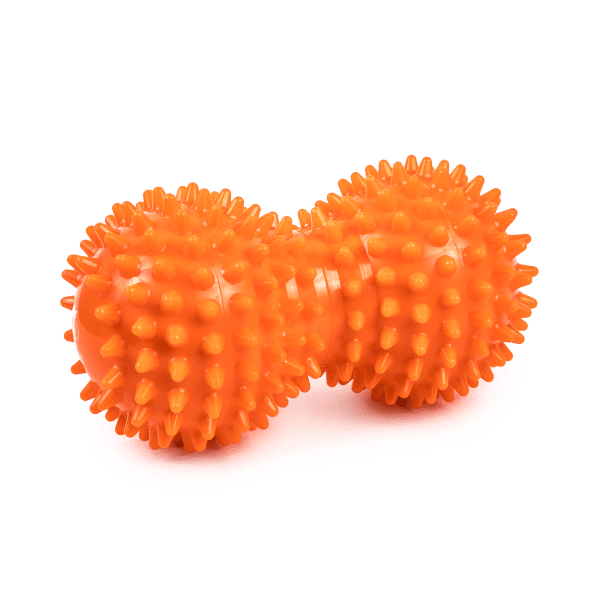 A peanut-shaped, spikey massage tool for fascia release and sensory stimulation on the feet, spine, and other areas requiring tension relief. This Franklin Method® massage tool features a peanut-shaped design that is ideal for fascia release on the feet and along the spine, helping to restore natural movement. In addition, its distinct “points” are designed to wake up sensory receptors in the body, increasing blood flow and making you more aware of your body and how it moves. The Fascia Toner is also ideal for use along other tight areas of the body such as calves, quadriceps, or other tense muscle groups, allowing you to perform invigorating and relaxing massage. Similar to the Franklin Fascia Massager™ Peanut but with gentler points, and a softer density that is more flexible and giving. Firmness can be adjusted with inflation; needle pump required. Measures approximately 5.5" L x 3" dia. I also have the purple Peanut Massager and I like that one as well, though this is definitely softer and less pointy. I will be recommending both to my patients and keeping both on hand for them to try. Some might like this over the purple one, it’s just personal preference. Both are good for plantar fasciitis and massage – it’s nice to have options!